Spring Cleaning on Ciao Amalfi! With the sun shining and summer right around the corner, I’ve been having feelings of “out with the old and in with the new” – the classic spring desire to freshen things up that brings on spring cleaning. Those of you who have been following Ciao Amalfi! over the past year probably remember that I planned a big overhaul of the blog last winter. Well, you probably also noticed that it didn’t happen. With a busy work schedule and nice weather coming, I can guarantee it won’t be happening until this coming winter. But, in the meantime, I wanted to freshen things up a bit around here. So, how does it look? Ready for the bright and sunny summer days ahead here on the Amalfi Coast? I’ve received a few questions already about the header image, which is a ceramic mural located in and showing the village of Vietri sul Mare on the Amalfi Coast. Vietri sul Mare has a tradition of ceramic production dating back to the 15th century, so it’s only appropriate that the city should have a beautiful ceramic representation of its most important church. The bright yellow and green dome and the campanile (bell tower) belong to the church of San Giovanni Battista, which has one of the most beautiful majolica tile domes on the Amalfi Coast. I’m not sure of the name of the other church depicted, but I love the procession of women carrying candles to the church. You can read more about Vietri sul Mare on my ItalyItalia Travel Guide. It’s a city that few tourists really see outside the main street lined with ceramic shops. But there’s a lot more to see and enjoy, like discovering little gems like this ceramic mural that I just happened across while walking through the streets of Vietri sul Mare. By all accounts this has been a bizarre spring. In fact, with all the rain and gloomy days I think I missed it completely. Just this past week the sun has come out bright and strong and I can feel the warm days of summer just around the corner. In the meantime, I’m enjoying this little bit of spring with its still cool evenings, crazy thunderstorms, sweetly scented air and birdsongs. I snapped this photo of one of the colorful fishing boats in Amalfi earlier this month. The orange fishing nets caught my eye and reminded me that soon the beaches will be filled with brightly colored chairs and umbrellas and these rainy spring days will be far from my thoughts. Ever wonder how I ended up here on the Amalfi Coast? Want to know about a couple of my favorite restaurants? Well, click right on over and read my interview Beyond Rome with Laura on the Amalfi Coast on the BrowsingRome.com website. This is one of my new favorite Italy travel websites, so be sure to check it out and read more about life in Rome, traveling in Italy and Italian culture and cuisine. Thanks BrowsingRome.com for the interview! Last week I was out on one of my favorite walks down to Amalfi, and as I came around a corner I heard the noon church bells from the Duomo beginning to fill the valley. I bolted down a few flights of steps to get to this lovely viewpoint where you can see the campanile of the Duomo and hear the bells ringing. Birds flitted about from tree to tree singing a happy song and seeming to compete with the sound of the bells. Sometimes it’s hard to put into words how the places we live and travel to become a part of who we are. 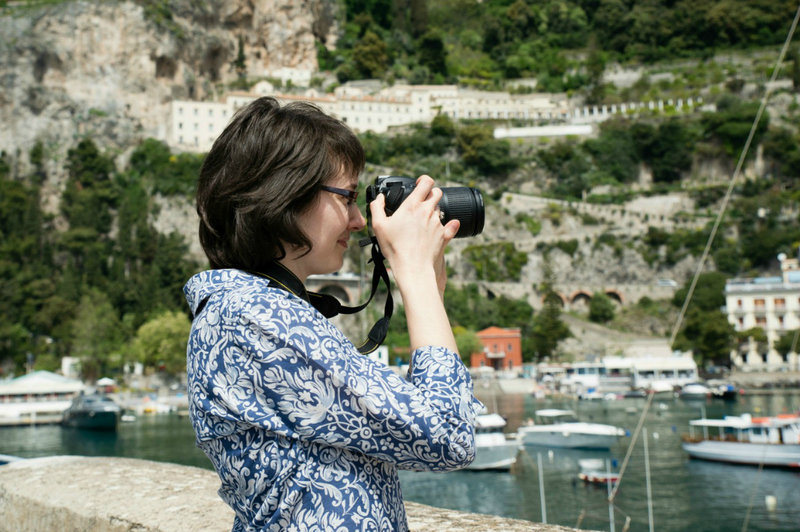 I’ve been enjoying the Travel Inspirations series here on Ciao Amalfi, because it’s given us all a chance to hear tales from some great travel writers around the web. Last week Cherrye Moore told us about her hometown, and before that we’ve visited Italy with Robin Locker, England & Italy with Lisa Fantino, Naxos, Greece with Mike Sowden, Hiroshima with Abigail King and Australia’s Gold Coast with Cecil Lee. This week we’re back in Italy as Danielle Russo from WhenInRomeTours.com takes us to the peaceful destination of Assisi in Umbria. In Italy, there is no shortage of works of art and natural beauty that will impress and maybe even astound you. Still, there is something unique about the Basilica of St. Francis of Assisi that I have never experienced in Italy or anywhere else. Though not a devout Catholic (far from it, actually), when I entered this shrine to St. Francis I felt a wonderful feeling of tranquility. For a few moments, I too felt holy! The Basilica of St. Francis of Assisi is the mother church of the Franciscan order of Friars and one of the most important destinations for religious pilgrimages in Italy. St. Francis is one of two patron saints of Italy (the other is Santa Caterina di Siena). When he was young, Francis was mocked for his charity towards the poor, and eventually renounced his patrimony, his father, and even his own clothes. He was inspired by the sermon of Matthew10:9, in which Jesus urges his followers to go forward with “neither gold, nor silver, nor brass in your purses” and devoted himself to a life of poverty. The foundation of this Basilica to honor this saint began in 1228 and is built into a hill, divided into three main areas. The upper level, the lower level, and the crypt where the remains of St. Francis are buried. The church is covered from top to bottom with frescoes by medieval Italian masters such as Cimabue, Giotto, Simone Martini, and Pietro Cavallini. 1. The tomb of St. Francis: The saint’s remains are above the altar in a stone box with iron clamps. 2. Relic Chapel: Here you can see a plate and chalice used by St. Francis for the eucharist, a prayer he wrote, and papal document legitimizing the Franciscan order. 3. The frescoes by Giotto on the upper level of the church. The Basilica of St. Francis became a UNESCO world heritage site in 2000. There is no charge to visit this church. The hours of the Basilica are 9:00 AM to 6:00 PM, although some parts of the church may open earlier and some will close later. See the website for full details. Danielle Russo is a coordinator of Rome and Vatican Tours. She lives in Rome, Italy and writes about travel for MNUI travel insurance as well as WhenInRomeTours.com.